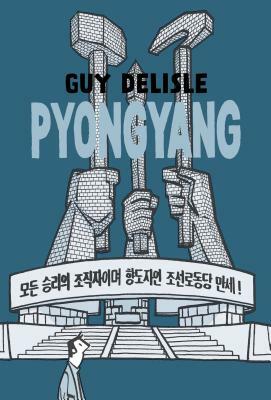 Guy Delisle’s Pyongyang: A Journey in North Korea is the graphic novel that made his career, an international bestseller for more than ten years. Delisle became one of the few Westerners to be allowed access to the fortress-like country when he was working in animation for a French company. While living in the nation’s capital for two months on a work visa, Delisle observed everything he was allowed to see of the culture and lives of the few North Koreans he encountered, bringing a sardonic and skeptical perspective on a place rife with propaganda. As a guide to the country, Delisle is a non-believer with a keen eye for the humor and tragedy of dictatorial whims, expressed in looming architecture and tiny, omnipresent photos of the president. The absurd vagaries of everyday life become fodder for a frustrated animator’s musings as boredom and censorship sink in. Delisle himself is the ideal foil for North Korean spin, the grumpy outsider who brought a copy of George Orwell’s 1984 with him into the totalitarian nation. The award-winning cartoonist Guy Delisle is the author of the bestselling travelogues Shenzhen, Pyongyang, Burma Chronicles, and Jerusalem: Chronicles from the Holy City, for which he won the Fauve d’Or at the Angoulême International Comics Festival. His most recent book is Hostage, which details the kidnapping of a Doctors Without Borders employee and appeared on best-of-the-year lists from The Washington Post, NPR, Globe and Mail, Quill & Quire, and more. Born in Québec in 1966, Delisle now lives in the south of France with his wife and two children.